Dr. Li is a full professor in Biomedical Sciences Dept. His group investigates how cells communicate in the brain & how neural disorders (stroke, epilepsy & Alzheimer's Disease) affect the brain function/structure. In particular, we employ cellular, molecular, biochemical and genetic approaches to address fundamental questions pertaining to the brain zinc. He studies the action of rising zinc in neuronal death, and whether zinc found in regenerated neurons is involved in epileptogenesis of hippocampus, a brain region that contains adult CNS stem cells. The role of zinc as a new class of neurotransmitter and its relation to learning & memory in neurophysiology are also current emphasis. 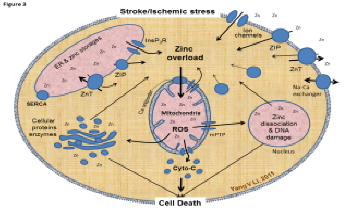 That zinc play an active role as a signaling factor in neuro-biology represents an emerging concept and a new field of research. Our ultimate goal is to develop new therapies to neurological diseases. Yang V. Li, M.D., Ph.D.